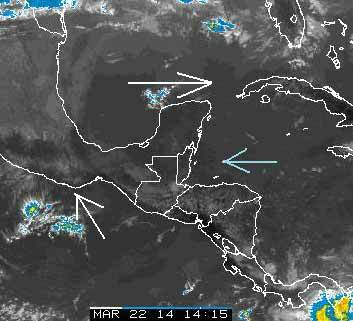 Belize NMS: Seasonably warm and mostly dry weather will prevail the next couple days. 24-hour forecast: Mostly sunny today with clear skies tonight and sunny skies tomorrow. Little or no rainfall is expected. Winds: East - southeast 5 - 15 knots. Today: Winds: E-SE 5-15 kts. ; seas: Choppy. ; waves: 2-4 ft.; little or no rainfall. Tomorrow: Winds: E-SE 5-15 kts. ; seas: Choppy. ; waves: 2-4 ft.; little or no rainfall. Marine Outlook: Sunday night:- Winds: East 10-20 kts. ; seas: Moderate. ; waves: 4-6 ft.; little or no rainfall. General Outlook: For Sunday and Sunday night is for continuing mainly fair and warm conditions with little or no rainfall. On ambergris Caye this morning it's sunny, with an expected high of 87.the breeze is from the East. A good day for fishing or anything you would like to do on the water. No rain on the Radar. . . .. .Looks like today and perhaps tomorrow, similar to yesterday. Some Caribbean cloud from the East, but mainly hot sun.